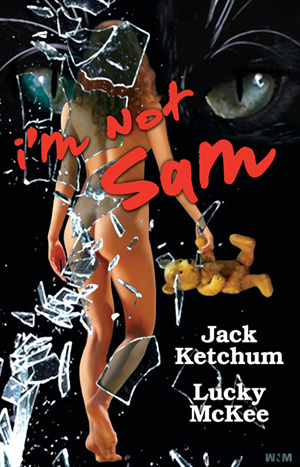 I’m Not Sam is the latest horror work from writers Jack Ketchum and Lucky McKee. It was originally conceived as a treatment for a movie, but they decided to release it as novella on the cemetery dance imprint. In the introduction, Ketchum writes about their decision to add a short story to the original work, since they felt it needed a third act. The result is “Where’s Lilly?” tacked onto the original which resolves some of the questions in I’m Not Sam. Patrick and Sam (Samantha) have a life that can only be described as idyllic. They live on a big tract of land somewhere near Colorado. They’re young, childless, and have all the money they need. Both come from stable families and have no skeletons in either closet they know about. Patrick works as and artist from home, illustrating graphic novels, while Sam earns her living as a Forensic pathologist for the county, investigating suicides, murders and other gruesome deaths. They live with Patrick’s elderly cat, Zooey. So Patrick is shocked one morning when he wakes up to find Sam huddled in the floor crying and reduced to the intellect of a 5-year-old girl. She insists “I’m not Sam” and that her name is Lilly. Patrick doesn’t know what to do and immediately phones the family doctor. Meanwhile he has to deal with his wife who’s been reduced to thinking she’s a preschooler. And this is what makes I’m Not Sam a horror novel. Most of Sam revolves around Patrick trying to care for his deranged wife. What do you do when the person you love most has become mentally deficient? And to drive the point home, we later discover Patrick’s mother is suffering from Alzheimer’s syndrome. He manages to get Sam to a clinic, but the doctor can’t find anything wrong. Therapy is suggested, but Patrick wants to see if he can care for her at home. The short story “Where’s Lilly” resolves the main feature and therein is my problem with the work as a whole. Some key information is revealed in it which is not present in the novella. This is a little bit similar to the detective in a murder mystery suddenly announcing he’s discovered something unknown to everyone which identifies the killer. There’s also a gut-punch conclusion which slams home the morality of the whole situation. Read with caution. Not for the easily offended.